It's 7am here in Novato, time to walk across the creek (summer dry now, except for a puddle or two under the rocks) and feed the goats and chickens. These last few weeks have been a country-living idyll, if you can call a mere 15-minute drive from an on-ramp to 101 the country. But the neighbors have horses, the only sounds at night are peacocks moaning and dogs barking, and across the creek and the little meadow is a former donkey stable turned goat-and-henhouse, home to two young goats, Teddy and Lila, each about the size of a spaniel, and 9 plump hens--4 blonde and bosomy Buff Orpingtons, 3 glossy Rhode Island Reds, and 2 perky little bantam Brahmas. The chickens tolerate the goats, since their presence involves the appearance of tasty sweet hay and goat chow twice a day. Teddy and Lila, meanwhile, accept life with a mess of clucking, pecking birds underfoot as perfectly normal. 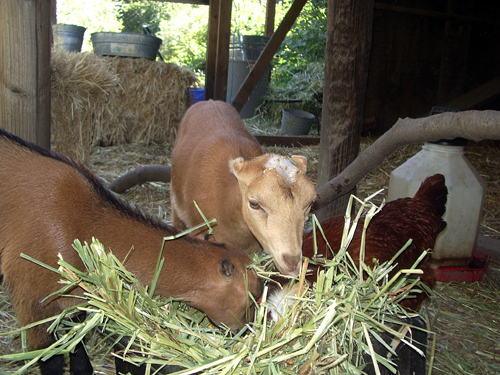 Right now, they spend a lot of time bending their little goat brains into figuring out how to get into the enclosure where the feed tubs are kept. It's wood-walled, locked and chicken-wired at every opening, but that hasn't stopped them from poking and butting at every opportunity. So far, living near these chickens has opened my wannabe urban-farmer eyes-- and ears. 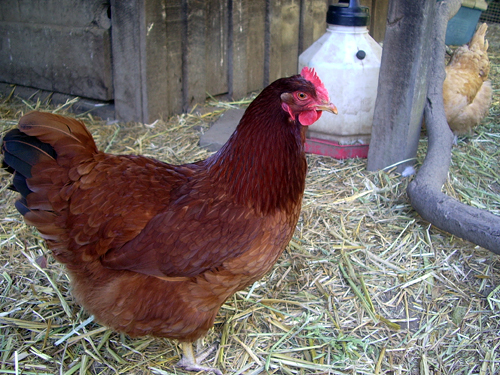 Chickens are noisy, even when there's no rooster around. Hens will cackle, call, chirp and just downright yell their feathered little heads off when they feel like it, 6am and your sweet dreams be damned. 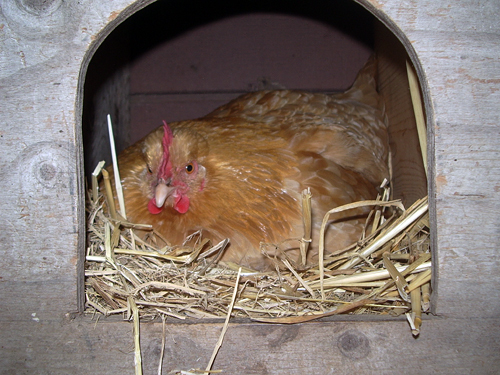 The look in a hen's eye when one approaches her in her nest could drill holes in a diamond. 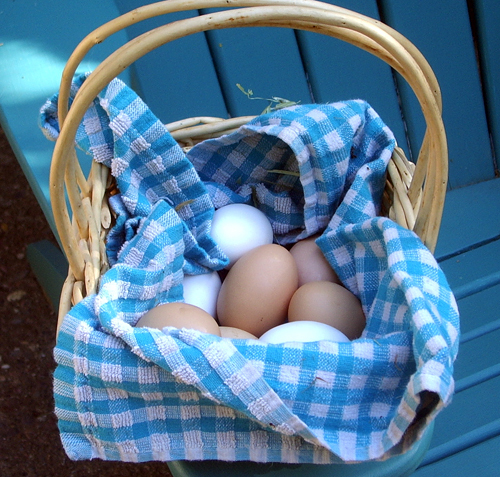 I know egg baskets lined with cheerful gingham dish towels do not exist in nature, but any hen worth her salt will know exactly what you're up to when you come sidling up to her, little basket slung casually over one wrist. One more step and I'll shoot, she seems to say, and so far I haven't be brave enough to put her glare to the test. There's already 2 dozen eggs in the fridge as it is, half left by the owners and half this week's haul. Some are white and dainty, others big and brown, but all are delicious as only new-laid eggs from happy hens can be. The yolks stand up and shout, bright yellow ringed by a thick, nearly aspic-like white. Hard-boiled, they're nearly impossible to peel--too fresh. But scrambled, poached, fried sunny-side up, they make getting crowed out of bed at first light seem worth it. Naturally, with the eggs of 9 happy layers at my disposal, challah, quiches, and custards of all sorts are looking pretty good. 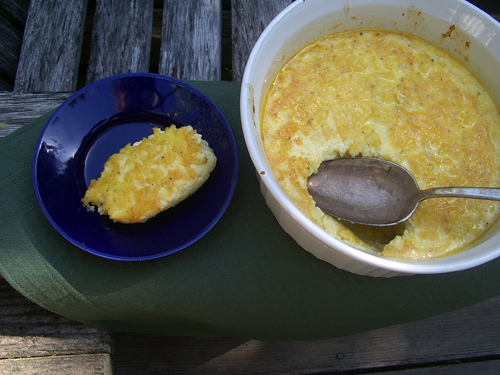 For something made with not much more than milk, cream, eggs, and corn, corn pudding has many variations, most of which hark back to the South. There are simple, silky puddings, trembling and delicate as a Japanese chawanmushi, baked in a water bath to cook the custard gently and evenly. There are brawny ones, made with cornmeal (or, more likely, Jiffy cornbread mix) like spoonbread, kissing cousin to a corn muffin. Some are spicy with jalapeno and pepper cheese, others sweet with sugar. Growing up, my mother made it the way her mother did: custardy and simple, baked in a white souffle dish and dusted with paprika for color. Sometimes she separated the eggs, first sauteeing some onion and red pepper in the butter, stirring in the flour then adding the milk and cream, bubbling it into a creamy white sauce. The egg yolks were whisked and tempered with a little sauce, then stirred into the sauce and cooked until thickened. The egg whites were beaten to drooping peaks, then quickly folded in and popped into a hot oven. Puffed and golden, this was no mere corn pudding but a puffed and golden corn souffle. Either way, served with broiled lemon chicken and a salad of ripe tomatoes dabbed with mayonnaise and fresh basil, these were eggs that tasted of summer. Getting the pan of hot water into the oven without splashing (and burning) yourself is the one hurdle to using a bain-marie. The easiest trick? Bring a kettle of water to a boil. Preheat your oven. Put your pudding dish inside a larger baking pan (there should be at least an inch of room all around the dish) and place it on the oven rack. Using the kettle, pour hot water into the baking pan so it comes about halfway up your pudding dish. Slide rack carefully back into the oven, taking care not to slosh yourself. When pudding is done, remove dish to a cooling rack or trivet. Leave the water-filled baking pan in the oven until cool, then remove. 2. Grate each ear of corn across the large holes of a box grater until all the kernels and milk are off the cob. Or, cut kernels off cob with a sharp knife and pulse a few times in a food processor to make a lumpy puree. 3. Whisk corn, flour, and salt together. 4. Whisk eggs well and add to corn mixture along with milk and cream. Whisk in pepper, hot pepper, and sugar if desired. Lightly grease a 6-cup ceramic souffle-type dish. Pour corn mixture into dish. 5. Place a baking pan large enough to accommodate the baking dish onto the oven rack. Put baking dish inside pan, and fill pan with hot water to come halfway up the dish. 6. Bake for 35 to 45 minutes, until top is golden brown and a knife inserted in the center comes out clean. 7. Let cool for at least 10 minutes before serving. Like most custard-based dishes, this tastes best when eating warm rather than hot.